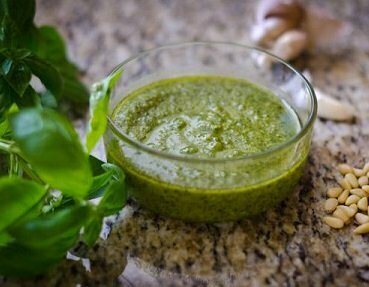 Pesto Sauce! Pat yourself on the back! You just “discovered” a great restaurant sauce recipe used to help build a successful restaurant business! The restaurant recipe is a customer requested sauce recipe, as are all the recipes on the website. So what is this delicious sauce good for anyway? You can create your own special recipes by adding this to other sauces, such as my Alfredo Sauce, or garlic butter, or soups. You can spread this sauce on sandwiches (especially turkey or chicken) or mix it with mayonnaise first and then use it on sandwiches. Mix this sauce with Ranch Dressing for a veggie appetizer dip! Spread the sauce on sliced French bread or artisan breads. Top the sauce with sliced marinated Mozzarella cheese (you can buy it marinated) and then lay it on a sheet pan and broil until the cheese is melted. This is a real crowd pleaser and is so easy! Toss cooked new potatoes in a pesto-garlic butter mixture! How about tossing tortellini pasta in this sauce for a wonderful flavor enhancement! You would probably enjoy using this recipe as a topping for fish, chicken, pasta salads and pizza! Preparation time: 25 minutes. Number of servings: 1 1/2 to 2 cups. Before you begin ... Heat a small skillet over medium low heat. When the pan is heated, add the pine nuts or walnuts stirring or shaking the pan back and forth over the heat to keep the nuts toasting on all sides. The nuts are ready when they are light brown and the wonderful aroma of toasted nuts is obvious. The nuts can also be oven toasted in a pie pan at 300 degrees F for a few minutes. Store the pesto in the refrigerator in a covered container or jar. If you are not using it immediately, stir it before using. Thanks for finding the website! Try this restaurant style sauce recipe and all the other restaurant recipes on the website. You can cook with confidence and style! Did you know? 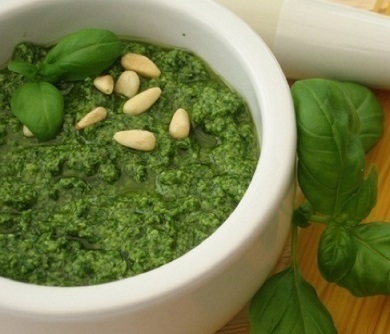 Basil, the main ingredient of modern pesto, likely originated in India and was first domesticated there. Basil took the firmest root in the regions of Liguria, Italy and Provence, France. This sauce did not become popular in North America until the 1980's and 1990's.